I was taught that praying “thy will be done” was a cop out, it was wrong, it showed a lack of faith in God. I know people who would even mock those who prayed this way. I was told to pray only for specific things because God wants us to be specific and because whatever we are believing God for is his will. This is in the olive grove called Gethsemane where the disciples kept falling asleep. They wouldn’t stay awake to watch and pray (I feel another nugget coming on!!) Anyway, Jesus prayed 3 times in this passage in verses 39, 42, & again in verse 44 the same things… “My Father! If it is possible let this cup of suffering be taken away from me. Yet, I want your will to be done, not mine”! “My Father! If this cup can not be taken from me unless I drink from it, your will be done!”. WOW!!! How powerful and awesome is that?!! Jesus himself prayed a prayer in the hope and faith that there may possibly be another way. Yet, in his faithfulness to our Father God and in his willingness to do what needed to be done for our sake, he prayed “your will be done, not mine”! If a prayer like this is good enough… Perfect enough for Jesus to pray, it is for me also! This kind of prayer is praying something specific to let God know what’s on your heart (as if he doesn’t already know). But!! It is allowing Him to, what I call “do his thang!”. Do you believe God knows better than you do? Do you believe he has a perfect plan for your life? Do you believe he knows things about you that you don’t even know yourself, even the number of hairs on your head? Do you believe our maker and creator knows the beginning from the end? I do!!!!!! I can and will pray everyday and send petitions in the name of Jesus hoping to please my Father in all I do. I will also allow him to “do his thang” and be who he is! I don’t have time to be God! His job seems to be too exhausting for me! 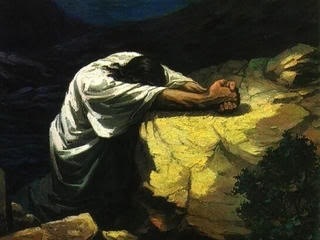 I trust Him completely… So, I say on this Good Friday, as Jesus has prayed many times… My Father! Thy will be done!!! Previous Don’t Empty The Cross!